#SuitDrive Give A Suit. Change A Life. Moore's Canadian Suit Drive is in it's fourth year, helping at-risk men transition into the workplace. It is a fundraiser of suits to make any man look his best on the job. Other men donate their gently used suits, and Moore's uses that suit to help to make another look and feel professional in their attire. With unemployment so high, it can hurt a person's confidence, but walking into an interview with a great suit on can give a person a boost of confidence that they need. You can help change a life by donating your men's clothing. Here is a list of recipient organizations. Donations are collected locally and used in the community they are collected in. It's a nice feeling helping those in your own community. Help spread the word for this great cause. Helping to raise an additional $10,000 for the cause by sharing this suit drive on your social networks. 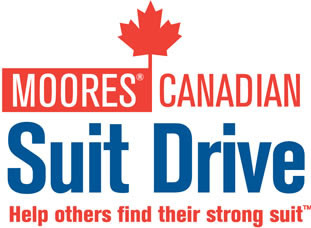 Be sure to use the hashtag #SuitDrive, and Moore's will donate $1 for each time you share! How cool is that?! Canadians can donate men's suits, shirts, jackets, pants, ties, belts and shoes at any of the Moore's stores in Canada. For appreciation, donors receive 50% off their next purchase from Moore's. I so can get into this support wise -thank you for sharing!